Cold Plate Heat Exchangers from Noren Thermal | Noren Thermal, Inc. In the world of heat exchanger technology, optimal performance relies on expert custom design. Sometimes, that means modifying certain aspects of common heat exchangers to fit the specifications of a unique design, or custom-designing thermal management solutions to ensure that unique applications’ needs are met. For instance, Noren Thermal has helped clients find optimal thermal management solutions by custom-machining cold plate solutions to provide more effective and efficient thermal management results than they thought possible. Cold plate heat exchangers utilize a combination of convection and conduction cooling methods to provide efficient thermal management across large surfaces. The plates, which are typically made from metal, have paths machined into them through which a cooling fluid with a high effective heat coefficient can flow through. The cold plate absorbs heat on the side closes to the source, and then the fluid flows to a heat sink or chiller where it can release the heat. 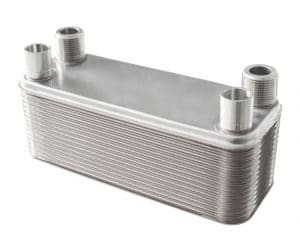 By absorbing electrical waste heat across a larger surface area than other heat exchanger designs, cold plates can provide highly efficient thermal management for a variety of high-demand applications. Like any heat exchanger, cold plates are designed with each application’s needs in mind. The size of each plate and the metal used to create them, the design of the flow paths that are machined into them, and the type of cooling fluid used within the system all depend on what offers the most efficient and effective cooling solution. At Noren, our team of experts utilize decades of experience and advance, on-site design and manufacturing equipment to create the most suitable cold plate design for your application. In some applications, cold plates may serve as the most effective and efficient thermal management option. To learn more, call Noren Thermal, Inc. at 866-936-6736. Now located in Taylor, TX, Noren proudly produces all of our products in the United States and delivers them to clients nationwide.